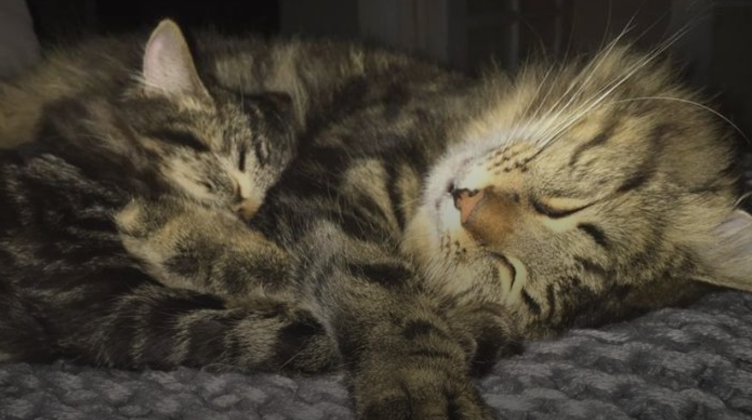 When Bailey the cat went missing, his owner spent days searching, trawling social media and checking and ringing councils - you know, like we tell owners to. "A horrific update. Our darling Bailey was picked up by Melville waste services and immediately placed in landfill. How can this be? How can any person or department deem the immediate disposal of a clearly much loved and cared for pet cat as humane treatment towards the animals or its devastated owners? Melville didn't even hold him for 24 hours, didn't concern themselves with him in any way, didn't even have the decency to place his info on a lost/found site with cat haven or rspca. They just threw him away like garbage. Bailey was the gentlest creature, he loved all people and all animals: he made friends with everyone and everything he met, he adopted our new kitten as his own and raised it as a mother would, he wasn't our pet, he was a family member. He deserved so much better than this. We are devastated." Just an up update on my beautiful Bailey boy. When the ranger was called for some reason they send out the "WASTE" team instead to dispose of loved ones pet by burying them in landfill with the rest of the trash. I suggest anyone else who has lost their fur baby to EMAIL the local council with details... seems it was the only way I could get any information because after 4 phone calls they still had no damn idea what I was talking about. Bailey was a healthy, loved family pet, not a stray. He wearing tags with his owners name, address and phone number on. He was only metres from his home. Despite WA boasting the most draconian cat laws in the country, designed and passed explicitly - we were told - to protect pets, a dead cat is still treated like garbage, disposed of at the local tip. 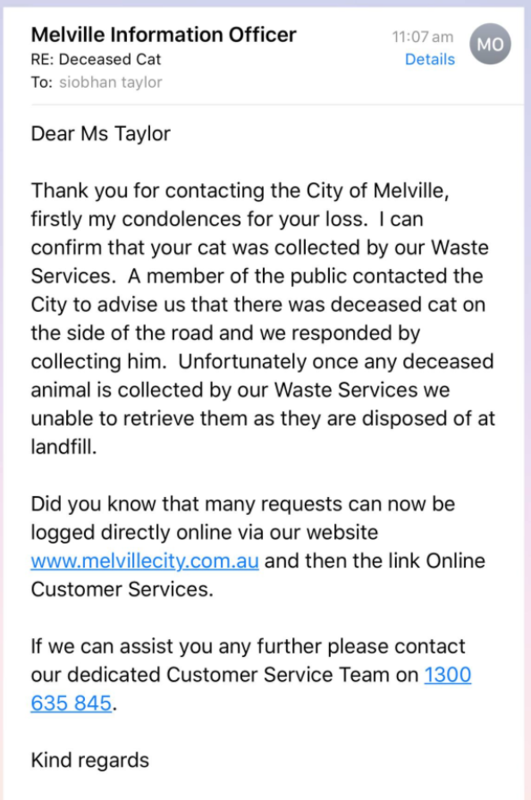 Melville has now advised the media that it will be changing its policy re: dead pets - that they will send out council staff, rather than garbage men. However, there's a catch - if the ranger isn't available and the replacement staff aren't carrying a microchip scanner, they'll be only checking for visual tags. They will also only be holding dead pets for two hours, due to "biohazard" claims. Iâ€™m not sure why there isnâ€™t some kind of holding facility. If a a cat is microchipped and tagged, I donâ€™t know why theyâ€™re not held. It shouldnâ€™t be like, youâ€™ve got two hours and theyâ€™re gone. Thereâ€™s over 800 cats missing in Perth who are microchipped and tagged, with the amount of money that people spend on microchipping and registering that pets should be, being held for people to get them back. Itâ€™s bad enough to lose your pet, but to not even be able to get them back and say goodbye? I'm beyond devastated. Why in 2017, do we have to tell councils we don't want our pets dumped like garbage? Why is this even still being debated?